Mailbag: How many prime time games will the Eagles have in 2018? The Eagles have played a prime time game in Dallas every year since 2012. Question from Dan: Over-under: 4 national prime time games next season. There’s no way they won’t have at least five again in 2018, as reigning Super Bowl Champions. Question from tbt: If you look at recent Super Bowl winners, you could argue that really only the Seahawks did not have a “running back by committee.” Do you think a lead RB is overrated? To begin, Super Bowl winners tend to have something very obvious in common – A great quarterback (or at least one that got really hot in the playoffs), or an elite defense / pass rush. Beyond that, I think that looking at smaller roster-building philosophies and using recent Super Bowl winners as the blueprint isn’t a worthwhile endeavor. As the odd saying goes, there are a lot of ways to skin a cat. Ideally, you’d like to have a running back who can do everything – run inside, run outside, be a weapon in the passing game, and pass protect. 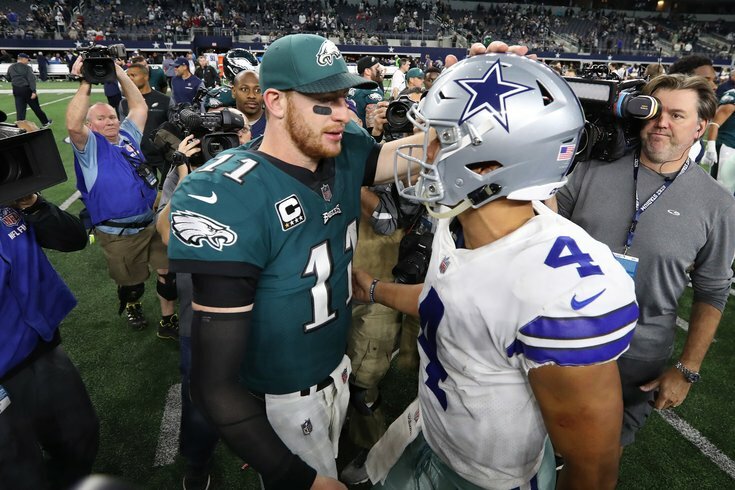 Beyond the back just being really good, when you have a guy like that, it makes the offense capable of running anything in the playbook, and thus less predictable, though certainly, the Eagles managed to stay unpredictable despite the lack of such a back. Would the Eagles (or any other team) love to have a back like Todd Gurley, Le’Veon Bell, or Ezekiel Elliott? Of course they would. Is it more important to have a franchise quarterback, a good pass rush, or a quality offensive line? In my view, those positions are far more important to building a winner. So, to answer your question, a stud “lead back” can absolutely help you win games, but because running backs tend to take a lot of punishment, I would never build my roster around one, and even with a star running back in place, I would want capable depth at the position. I’m not so sure who’s overrating having such a back. The NFL in general certainly isn’t. A few decades ago, the running back was often “the guy” on an NFL roster. These days, tight ends are making more money. Question from Robb Gaylord: How is it that year after year, the Patriots properly restock their draft picks? Even when draft picks have been taken away due to cheating, the team seems to reload with picks. The latest example being with the Cooks trade. How is it other teams aren’t able to replicate their success? The Pats aren’t always able to restock their draft picks. Last year they only had four picks – two 3’s, a 4, and a 6. That’s it, and only one guy contributed at all as a rookie. And yet, they still had eight draft picks that year, eight draft picks in 2017, and they would have had eight draft picks in 2018 right now if they hadn’t traded for Ronald Darby and Jay Ajayi, who ended up contributing on a Super Bowl winning team. They also still managed to have a draft pick in the first round every year, due to the Sam Bradford heist just before the start of the 2016 season. Question from Brady’s Depleted Footballs: It seems like the Eagles have plugged all their holes with low-cost vets. Does this open the door to go BPA throughout the draft? I think the Eagles know there are certain positions they are going to take at some point during the draft. For example, I would be shocked if they didn’t take at least one running back and one tight end. But, yes, by signing low-cost vets prior to the draft, they’ll at least have experience at some positions should the draft not unfold the way they’d like it to. Question from Dude: I don’t remember the Eagles ever getting compensatory picks. Is that Joe Douglas’ influence, or just circumstance? It’s just circumstance. When the Eagles were a great team in the early 2000’s, they got compensatory picks almost every year. In fact, from 1994-2017, the Eagles received 30 comp picks for losing free agents. Only the Ravens, Packers, Cowboys, Patriots, Rams, and Steelers earned more during that span. What do those teams have in common? Well, they all won multiple Super Bowls during that span, except for the Rams, who only won one. As rosters begin to fill out with impressive depth, it becomes very difficult to retain everyone. That’s just the side effect of having a really good team, and we’re already beginning to see the difficulty of keeping everyone now with this Eagles roster. In a league that seeks to have parity, comp picks are a rare outlier where dominant teams are helped. Comment from Patrick: I’d like to thank those in the Philly media for creating a new obsession with Eagles fans… comp picckkkkzzz. I’ll go ahead and take full credit on that. And you’re welcome.